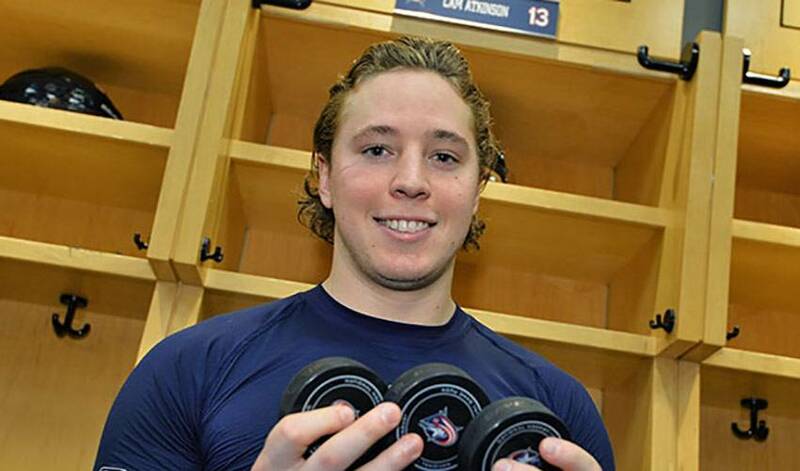 He’s been fielding plenty of questions about other teams and players during the summer hockey camp he’s running, but Cam Atkinson is hoping he and his teammates will be the hot topic of conversation in 2015-16. Deflection drills are no doubt one of the skills that are taught at a popular Connecticut hockey camp headed by a two-time 20-goal scorer and member of the Blue Jackets. But, when it comes to answering queries from the wide-eyed participants, Atkinson, coming off his second full NHL campaign, isn’t the type to deflect any questions, even if they don’t always centre on the winger and his Columbus mates. “I get asked a lot about some of the big-name players around the league, guys like Sidney Crosby, Alexander Ovechkin or Henrik Lundqvist,” offered the 26-year-old, who netted an NHL career-best 22 goals in 2014-15. Atkinson’s hope is that come next year’s summer camp, a majority of what he’s asked about focuses on a successful season for a team that had great expectations heading into last year, but wound up skating away disappointed. A big reason for the end result, namely, missing the playoffs, was the injury bug, which was more of an epidemic for the Metropolitan Division squad. In fact, the Blue Jackets led the league in man games lost with 502. At one point of the season, there were 15 players on the injured reserve list. Acquiring Stanley Cup champ, former Chicago forward, Brandon Saad, via trade, along with gritty winger Gregory Campbell, has undoubtedly boosted Columbus’ post-season aspirations. For the time being, though, Atkinson, the 157th overall pick in 2008, will focus on passing along some of the skills that helped land him his dream NHL role. “The most rewarding part of running a camp is giving back to the community and teaching the kids a thing or two they wouldn’t have learned in the past,” said the Boston College standout, who scored his first NHL hat trick on April 5, 2012, coming against Colorado.